The areas of roof not covered with Straightwork, are often called Features. They can vary in size, from a few square feet to a whole roof. One thing these all have in common, is that they are more difficult than straightwork to thatch, thus costing both time and money. Thatchers like roofs with as few features as possible; here work slows down and skills are tested! Before seeing how they are thatched, on the next three pages, there’s an important point to make… The various features divide into two groups; which do not mix well together. The first set of features… This set of features, should only ever appear in areas of straightwork. These consist of eyebrow and dormer windows. Chimneys built away from gable ends. And anything that protrudes through the coatwork; such as vent pipes. These are what could be termed Straight Features… All these need to start and finish in straightwork; as they have straight sides. Which turning thatch will not accommodate. 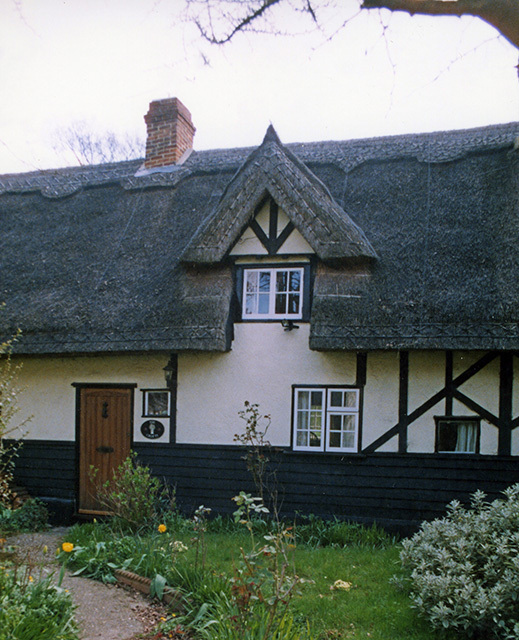 Masonry, Rolled and Boarded Gables; where the thatch does not turn, as it approaches the edge of the roof; can also be included in this group. As they will allow the insertion of other straight features near them. Straight features… The straight sides of this large eaves chimney, need to be surrounded by straight coatwork; to form a waterproof seal. As do the ridge chimneys, in the next photo. 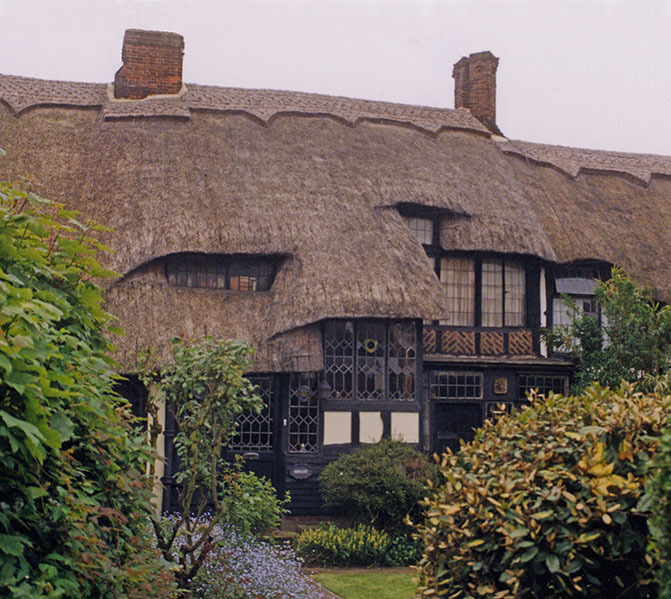 The windows here, both eyebrow on the eaves and dormer, surrounded by thatch; also have straight sides and require straight thatching all around them. 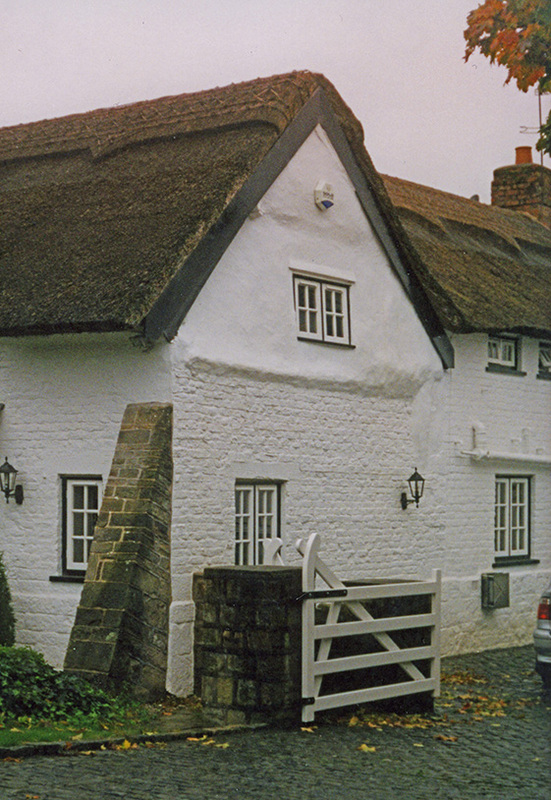 Left thatch; at Grampound, in Cornwall. 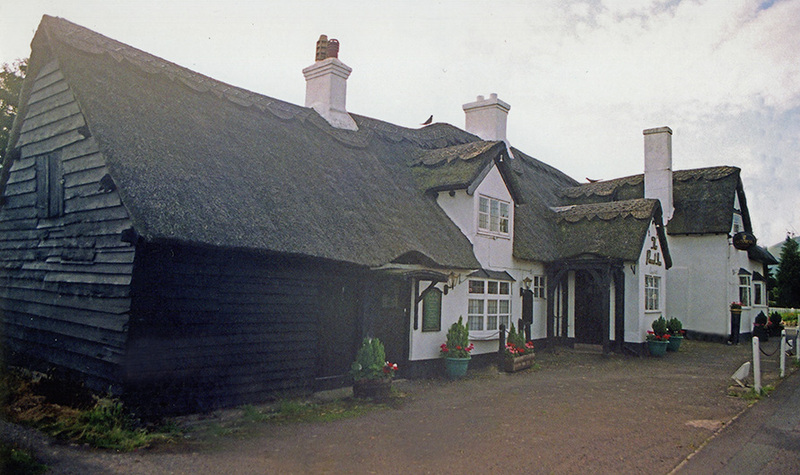 Top thatch; at Wembley, in Middlesex. 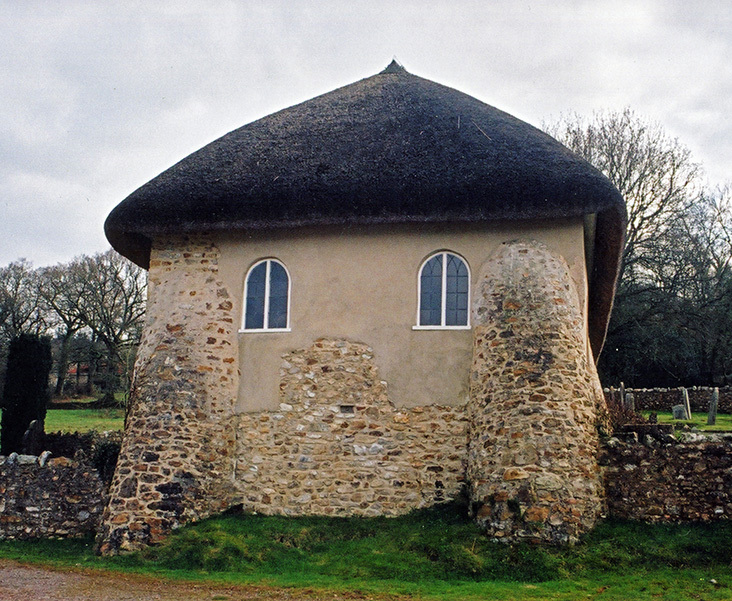 No turning… From the left, a masonry gable end, formed by continuing the wall on up, to accommodate the thickness of the thatch. Next, a rolled gable, created by the thatcher keeping the coatwork straight. Then wrapping it over the edge of the roof. Often fixing it in place with some decorative spar work…Finally a boarded gable, similar to the masonry one. But created by fixing a large timber ‘bargeboard’ to the roof edge. Thatches from the left; Deeping St James, in Lincolnshire. 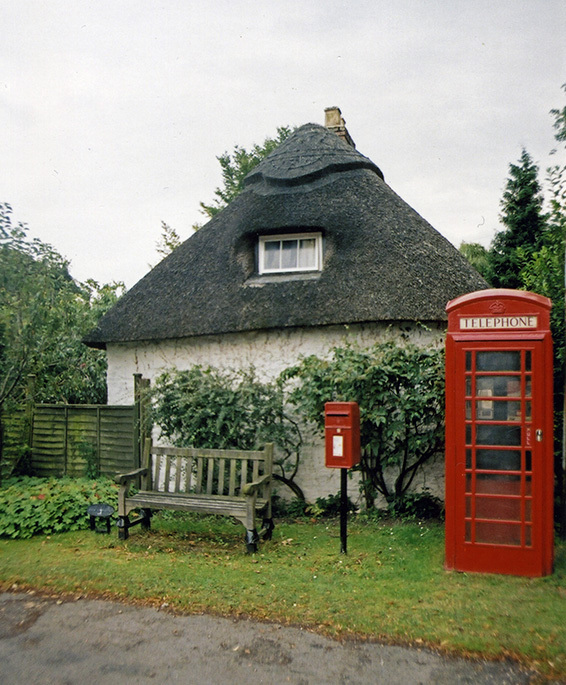 Sidlesham, in Sussex. Down Holland, in Lancashire. Creating such features as… Right and Left Hand Turning Gables (where the coatwork swings out over the gable wall) and the chimneys that sit over them. Full Hipped Ends, Half Hipped Ends, Quarter Hipped Ends and Valleys. 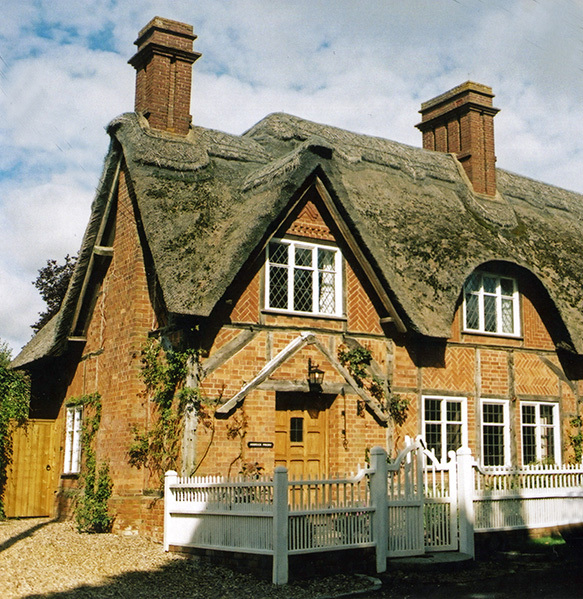 The ultimate member of this group, has to be the circular roof; where the thatch never gets straight… Unsurprisingly, all these can be termed Turning Features… None of the straight features sit happily in these. But all the turning features will easily accommodate each other. 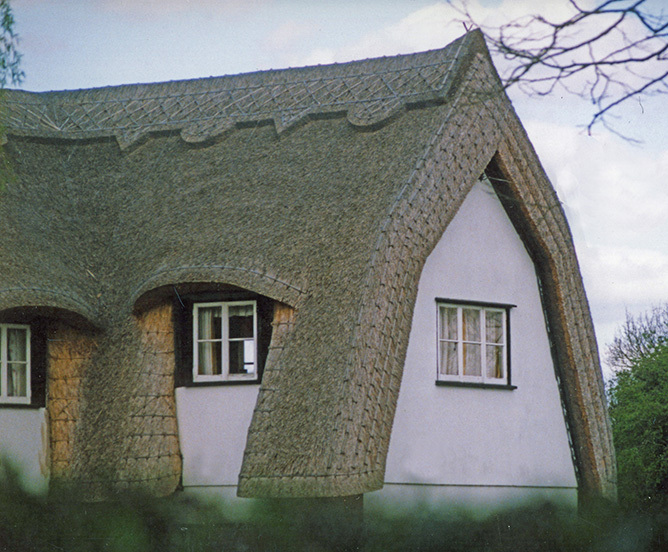 Some turning features… After completing a very large eyebrow window in straightwork; a thatcher, working from the right, has then turned into a valley… Quickly followed by a left hand turning gable. Starting again on a right hand one, flowing into another valley. Then swinging into a final left turning gable. This may look, and is, a very complicated piece of roof. 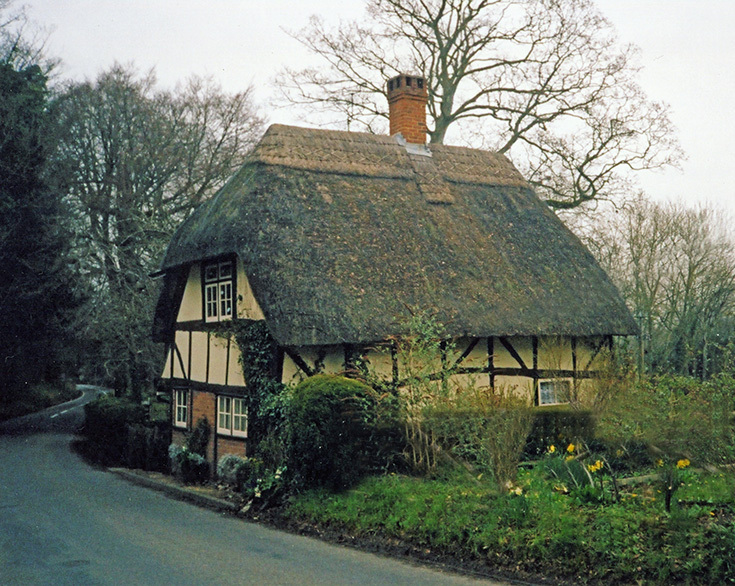 But as the roof design allows the thatcher room enough, to initially turn into the first valley, and all following features are turning ones; the roof is not that difficult to thatch… Thatch; at Adstock, in Buckinghamshire. More turning… A full hipped end, on the left; a half hipped roof on the right. The half hip consists of turning gables, topped by a hipped end. 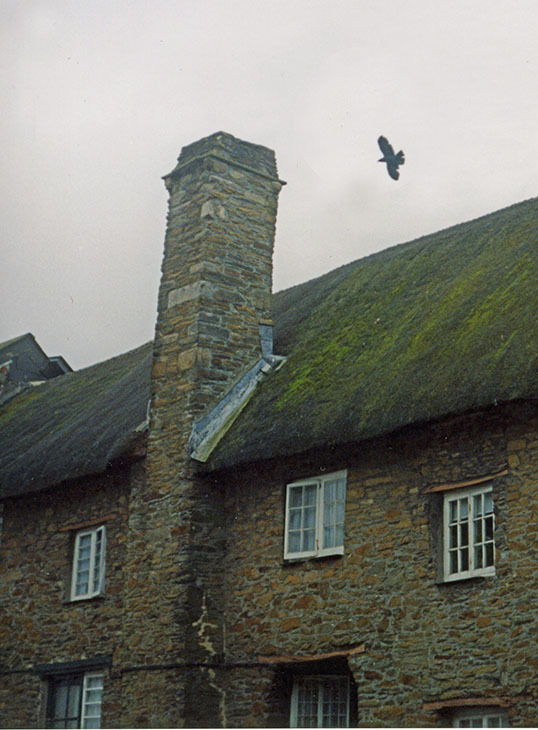 If the correct angle of turning is maintained, these two features combine easily… A full hipped roof , is perhaps, the most demanding feature a thatcher has to cover, on a regular basis… Left thatch; Loughwood, in Devon. 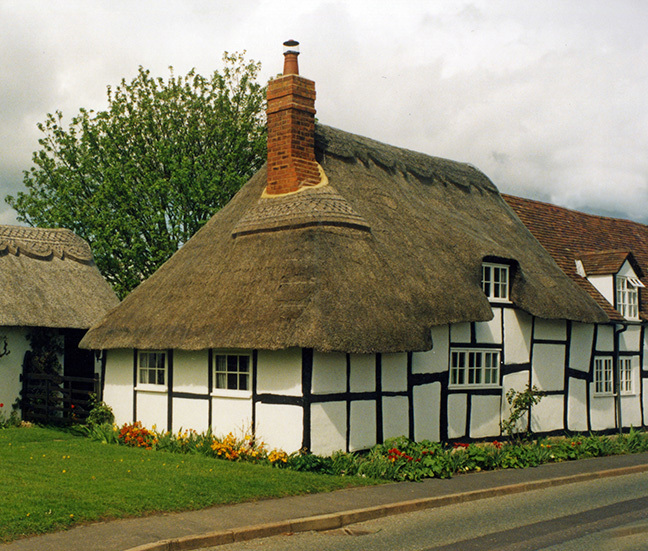 Right thatch; Wherwell, in Hampshire. Always turning… Circular roofs. As long as enough tapered material is at hand; these are easy features to thatch. 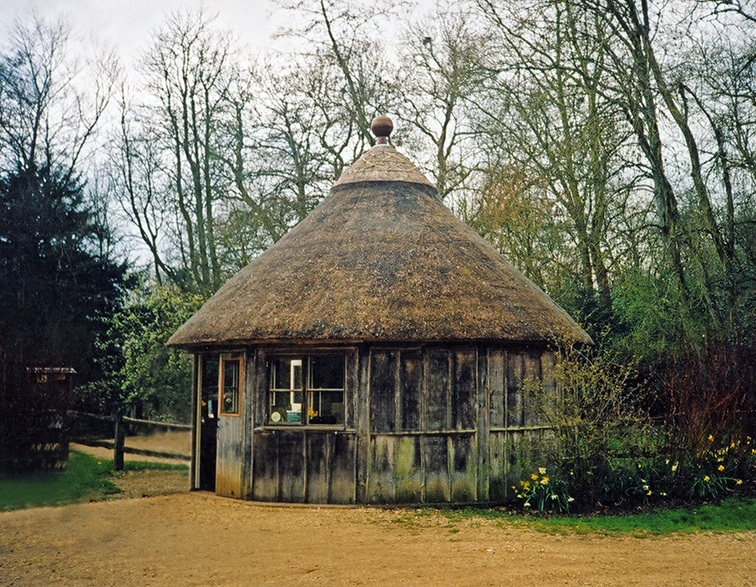 Thatch; at Mottisfont, in Hampshire. The other combination feature, is a Saddle. This is created at the point, where a lower roof joins into a higher one. 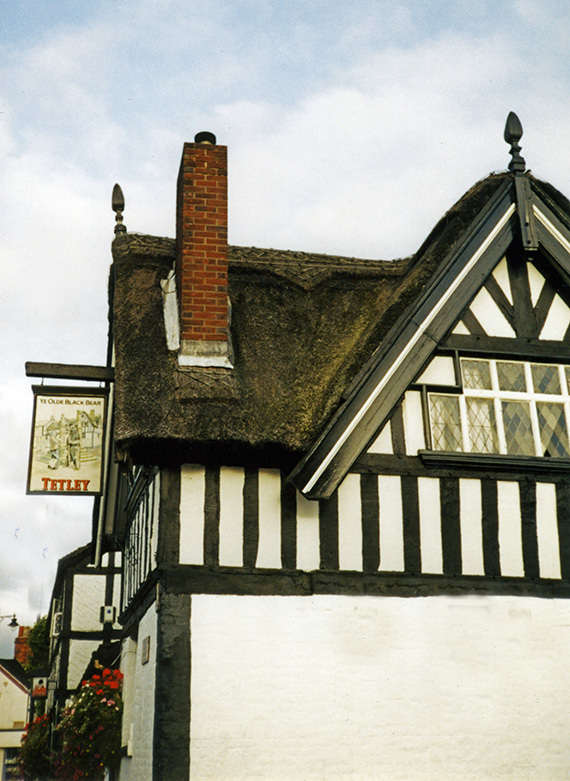 These consist of straightwork, on the main roof, running over the tops of the turning valleys, of the lower roof… This pub has three, on the front elevation alone. 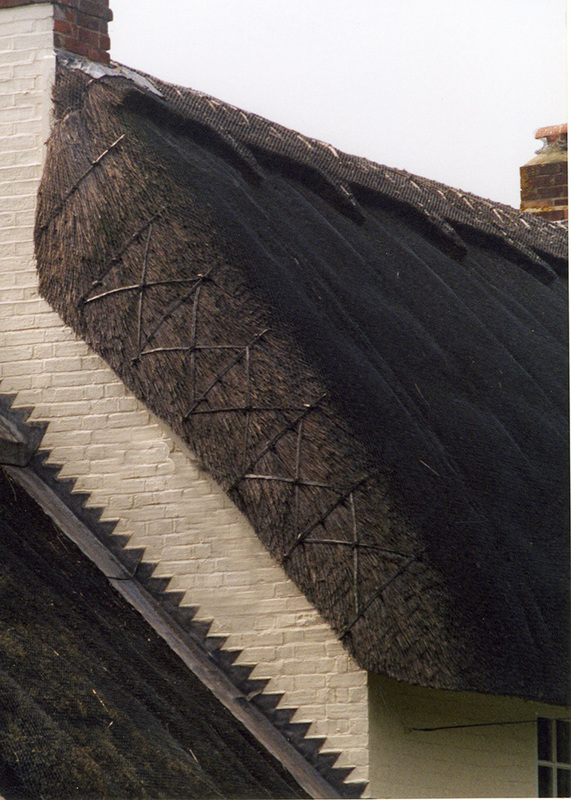 Creating an interesting job for any thatcher… Thatch; at Leebotwood, in Shropshire. More problems… The window on the left proved to much for thatch. Being in the very worst possible place, at a valley bottom. But a little clever tiling, turned the problem into an attractive part of the roof. Much easier to contend with is the right dormer window. In a hipped end, yes, but confined within the central, straightwork, part of that feature. 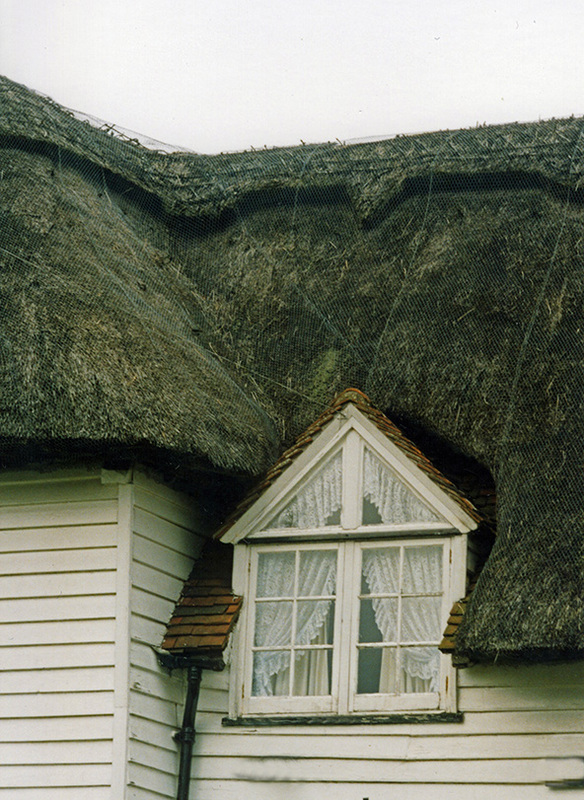 Small windows sit well in such positions; but nothing too ambitious should be attempted… Left thatch; Yalding, in Kent. 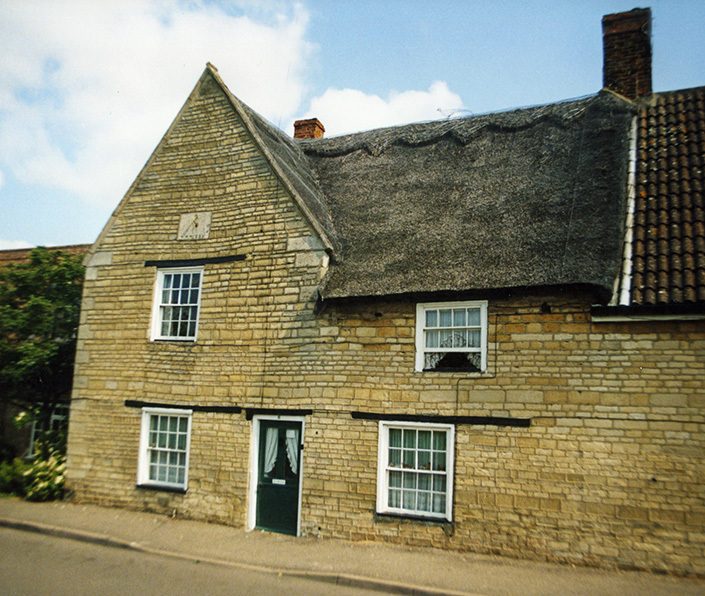 Right thatch; South Willingham, in Lincolnshire.